AutoForm Engineering Gmbh has unveiled AutoForm Hydro 2016, its rapid tool-design and simulation software for tube hydroforming. 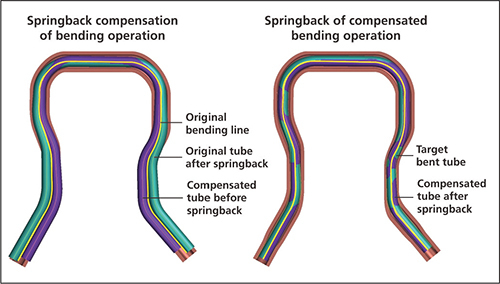 Among several significant enhancements is new and unique functionality for springback compensation, based on accurate springback-simulation results. To compensate for springback during bending, the software generates a new bend line using the same springback value in the opposite direction, and adjusts process parameters while the tool geometries remain unchanged. For hydroforming compensation, the software takes into account springback after hydroforming, addressing all modes including translation, twisting and crowning. Automatic updates of tool geometries results in compensated tools that easily can be exported. By identifying and analyzing the root cause of springback, engineers also can define the most effective compensation strategy for the project at hand. Other new enhancements to AutoForm Hydro 2016 include use of force-controlled axial tools for bending and hydroforming; appropriate positioning before bending operation; generation of fillet radius for upper and lower dies; and volume-controlled hydroforming.